Subjects and Themes(Dreaming): Awelye, Bush Medicine & Pencil Yam. 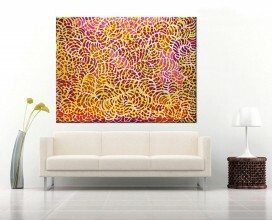 Aboriginal artist family. 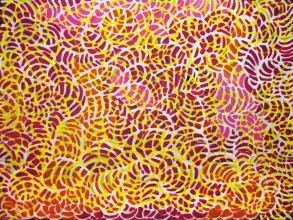 She is the niece of the late great Emily Kame Kngwarreye (who sadly passed away in 1996). 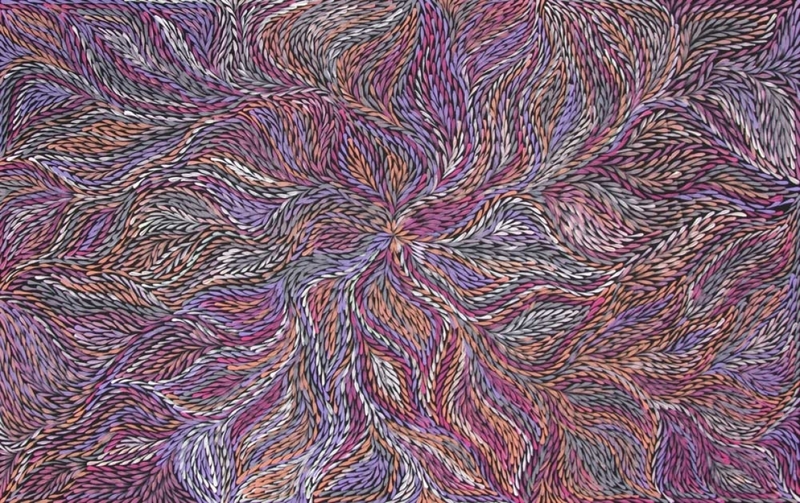 Her sister is Rosemary Petyarre and her half siblings are Evelyn Pultara (2005 National Aboriginal and Torres Strait Islander Art Award winner) and Greeny Purvis Petyarre (who sadly passed away in 2010). Like many of the women from Utopia, Jeannie was introduced to modern art mediums through her involvement in the community projects that occurred in Utopia in the late 1970’s and 1980’s. The first of these, shot Utopia into the art world through their “Utopia: A Picture Story” project which introduced the women of Utopia to silk batiks. The project was such a success that the whole collection of 88 silk batiks was acquired by the well known Robert Holmes a Court Collection and went on a touring exhibition around Australia and overseas. 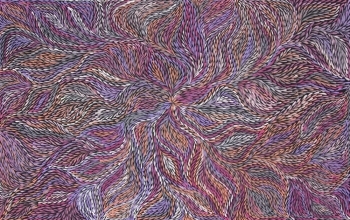 Jeannie’s batik depicted Alhalkere country (her homelands) where goanna, dingo, and bush turkey can be found aplenty. She depicted the tracks of the animals which can be found in amongst corkwood flowers, bush tomatoes, wild tobacco, centipedes and scorpions. In 1989 she also participated in the “A Summer Project”, another community project which introduced the women to canvas and acrylic paints. Similarly, to the first project this was a huge success and the women of Utopia flourished with this medium. Jeannie was encouraged by her aunt, Emily Kame Kngwarreye, to continue to paint her family’s “Yam Dreaming”, this particular Dreaming is a strong one for the women of Utopia and was passed down to Jeannie from her father’s side. Jeannie depicts various stages of the plants growth and parts including the seed, leaf and flower. The Yam plant is used by Aboriginal people for its medicinal properties which can be used to treat various ailments including sores and bites. She also depicts the Awelye ceremonies which the women participate in to pay homage to their ancestors. 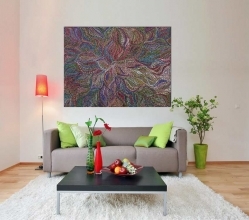 Jeannie has participated in various group exhibitions around Australia and several exhibitions which toured the USA, United Arab Emirates, France, Italy, Turkey and China. Some of her paintings are held in well known and highly regarded collections such as the Holmes a Court Collection and the National Gallery of Australia. 1990 “A Picture Story Exhibition of 88 works on Silk from the Holmes a Court Collection”, (touring Eire & Scotland). 1993 “Central Australian Aboriginal Art and Craft Exhibition”, Araluen Arts Centre, Alice Springs. 2005 “Cicada Trading”, Illayda, Istanbul, Turkey. 2005 “Cicada Trading”, Milan, Italy. 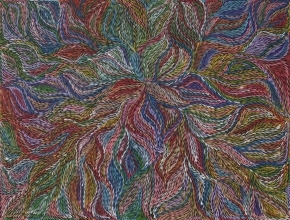 2006 “Cicada Trading – The Annual Clear Lake Exhibition of Aboriginal Paintings”, Houston, USA. 2006 “Cicada Trading”, Paris, France. 2006 “Cicada Trading”, Bahrain Art Society, The Kingdom of Bahrain. 2006 “Cicada Trading”, Adu Dhabi, United Arab Emirates. 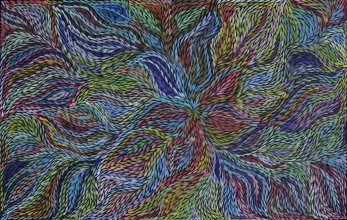 2006 “Relocation Exhibition”, Redrock Gallery, South Yarra. 2007 “Gallery Grand Opening Beijing”, Redrock Gallery, Beijing, China. 2007 “Group Exhibition”, Redrock Gallery, China World Exhibition Centre, Beijing, China. 2007 “Group Exhibition”, Redrock Gallery, Grand Hyatt Hotel, Beijing, China. 2007 “Group Exhibition”, Redrock Gallery, International Art Expo, Beijing, China. 2008 “2nd Grand Opoening”, Redrock Gallery, Beijing, China. 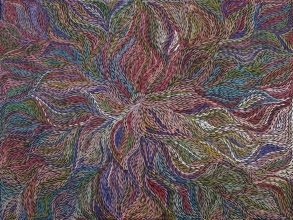 2010 “Tradition to Modernity”, Central Art, Alice Springs (touring Tasmania). The Holmes a Court Collection. 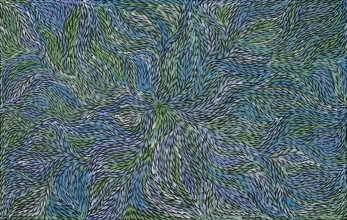 The artwork depicted is a presentation, referring to seasonal changes and flowers the Pencil yam plant. The Bush Yam plant is one of the most reliable sources of food. The yam is most abundant after the rain when the root system is at its most prolific stage of regeneration. The Bush yam grows underground with a vine shrub that grows above ground up to 1 metre high. The Bush Yam is normally found on spinifex sand plains and produces a large pink or yellow flower after the summer rain. The Bush Yam (‘Anaty’) is much like a sweet potato and can be eaten raw or cooked. It is still a staple food for the desert Aboriginal people where it can be mostly harvested at any time of the year. The Aboriginal women from Utopia use digging sticks to gather the edible white root, which is an important food source (bush tucker). The leaves are collected and used for medical purposes. The women also honour the spirit of the yam plant during Awelye ceremonies to ensure perpetual germination.